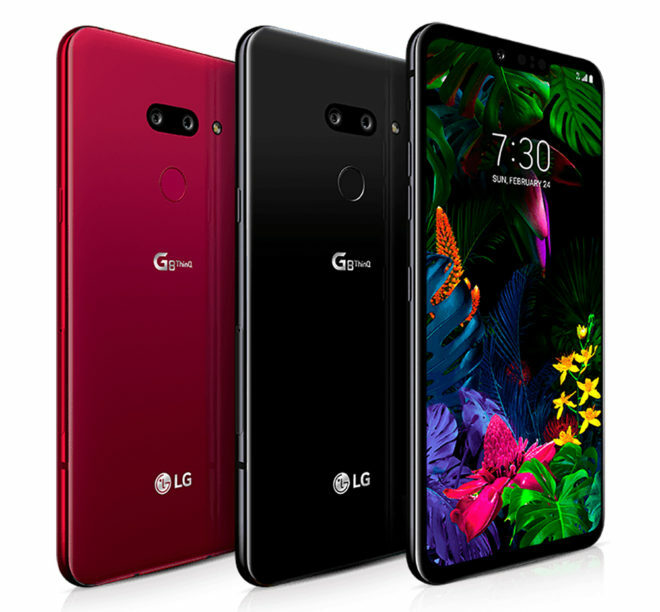 The LG G8 ThinQ is now official as the latest entry in LG’s G series of Android flagships. One of the highlight features of the LG G8 ThinQ is its Z Camera, which uses Time-of-Flight to enable some unique functions. One of these is Hand ID, which identifies you by recognizing the shape, thickness, and other individual characteristics of the veins in the palm of your hand. You can then use your palm to unlocked the G8 ThinQ by placing your palm in front of the front-facing camera. The LG G8 ThinQ’s Z Camera also enables a feature called Air Motion. With it, you can answer or end calls, take screenshots, switch between apps, and adjust the volume without actually touching the phone. Just wave your hand in front of the device or pinch the air. Another notable feature of the LG G8 ThinQ is its Crystal Sound OLED. This enables the G8 ThinQ’s screen to act as a speaker diaphragm, meaning that the G8 ThinQ doesn’t have a front speaker like most other smartphones. Speaking of audio, LG has also included a Boombox Speaker feature with the G8 ThinQ that’s capable of stereo output. There’s a 32-bit Hi-Fi Quad DAC included, too, and support for Master Quality Authenticated tech allows for high-res audio streaming. When it comes to raw specs, the LG G8 ThinQ has most of the features you’d expect from a flagship phone in 2019. It’s got a Snapdragon 855 processor, 6GB of RAM, 128GB of built-in storage, and a microSD card slot. There’s a 6.1-inch 3120×1440 OLED screen with a notch (making this the first LG G phone to have an OLED screen) and an 8MP camera, and around back is a dual camera setup with a 16MP super wide angle sensor and a 12MP standard snapper. There’s a fingerprint reader around on the back of the G8, Android 9.0 Pie, and a 3500mAh battery that’s powering the whole package. T-Mobile today confirmed that it’ll launch the LG G8 ThinQ, complete with 600MHz LTE support. There’s no word yet on pricing or a precise launch date, though. T-Mo hasn’t said if it’ll carry the LG V50 ThinQ that was announced today alongside the G8, but I’ve asked T-Mobile about the device and will update you when I hear back. Cool. Can I get Pie on my G7 ThinQ now? Slow and non-existent updates is one of the main reasons I gave up on LG phones. I think they often come up with very nice phones but don’t provide the necessary software support for updates and fixes. Honestly, I am happy with the G7, if the G8 kept LCD for the display, I may have upgraded, I have a boring joh, and use my phone a lot more than others, I like having a display that isn’t succeptible to burn-in, as OLED is. . .but I did order a 256GB microsd card from Amazon just now! Upgrading that from a 64GB card. Off-topic, as a semi-budget alternative, a Stylo 5 would be great. Too bad that line has been discontinued. I’ve been on a Moto kick for the last several years. The LG’s and Samsung’s haven’t brought me back around. This doesn’t look like it will do it either. Great idea. A 6+”, 128gb, NFC Moto would be outstanding. Cause they tend to make their phones on the smallish side. When did Lg do this? Mmmmm,It would be great if some phone maker came up with mid-level phone that’s 5.7-6.2,with at least 64 and 4. I know they do have them,they refused to release them here,or the carriers refuse to carry them. The mid-level Lg,Tmo has,I read different things about it,some love it,some hated it,some said it is pretty fast,others have said lags and slow. It has 4 gigs of ram,so it is not that might be the processor,it like 400 something snapdragon. The price they have on it,pretty hign,$350. Go to Costco you can get for $300. Still hign. Wrote about this before. There a store on Ebay that sells brand new phones,that all the big 4 stop selling. They are located in NYC. They sell the V-30,for like $300. or a little more. They sell The Moto Z Play,for about $230. If you go ebay just type in V-30,the store will show up. You are correct Sir. MOTO almost has done it…but they tend to be on the smallish side. Brands seem to release their bigger and better-specced for Asia–sending the smaller & lesser-specced here. Maybe they rationalize that less bands & no NFC balances out the cost. And thanks for the tip, I’ll check it out! Years ago Chinatown & Little India used to be the areas to go to. Pricing should be around the same as the G7 was, $750. I would have wished for in screen fingerprint, but without it along with no 5G costs should stay low to be competitive. I just dropped my LG G7 for the Samsung S10 e promo… Samsung finally decided to do LG better than LG itself. In today’s day and age with important internet commentary and sharing information and trying to remember recipes…. it’s crazy stupid how LG could not master the scrolling screenshot and make it work within every single app. It’s also dumb to think I paid close to $259 to go back to Samsung to get the scrolling screenshot feature but a handsome trade-in credit and spread out over 36 months made it an easier pill to swallow. LG’s Capture Plus sucked so bad that it made me jump back to Samsung as soon as I found out wide angle photography was going to be standard on all Samsung S tens. Wide-angle was the only Advantage LG had as far as the cameras goes. For a while the rumors were that the wide-angle lens was only to be available on the curved S10. Thank God that was not the case. LG dropped the ball with not having scrolling screenshot. Saving $50 and possibly getting a cheaper LG over Samsung just no longer makes any sense. Even the Chinese phones had the scrolling screenshot feature. Before someone retorts LG had scrolling screenshot it only worked within like Google Chrome and I’m sorry I like my Adblock browser too much such as Brave or Firefox to use a resource heavy battery draining browser like Chrome. I just got tired of glitchy software. I’ve had the G4/5/6 and my wife had the G4/6 with both G4s bootlooping, before we switched to Samsungs. I’m not going back to LG. You are better off getting an s10, after watching these videos of people trying to use this new hand featue, it’s a joke. LG really has to do something else to compete. My Mom has a G6. Will there be any discounts on the G7 (now that the G8 is released), even if she trades in the G6? There’s actually currently a BOGO on the G7 through T-Mobile. No Add a line required. Might pick one up if there’s a bogo. No way am I buying this at full price. Like my V30 screen. Plenty blight. I notice the blue tinge when looked at off angle – but that isnt nearly as big a deal as what I read. It actually is kinda cool look. Where do you get thjs stuff? I have found initial reviews tend to be overwrought. Where do I get what stuff? If I’m sitting in a dark room and the auto brightness turns the screen to 0%, the black levels completely drop off at a much faster rate. Anything that’s below a certain shade of gray immediately just drops straight off into pitch black. It makes watching TV shows, movies, Snapchat videos completely useless. It’s even worse with the blue-light filter enabled. It gives everything a red tinge. I made them order a replacement for me, stating is was faulty. Guess what, second phone did the same thing, maybe even worse. Honestly, I loved my G4, V10, and V20, but the V30 just left such a bad taste in my mouth. It would be nice if the auto brightness could be adjusted better – but it never gets that dark. If I watch movies and it is Too dark I swipe down and turn off the auto brightness amd adjust the ligjt to my liking – not that hard. Yeah that’s fine and all, except the phone doesn’t work like it’s intended. It’s a glaring oversight that should never have passed QA. I hope LG prices this G8 and the V50 correctly, without applying discounts a few weeks after launch. The G8 should be priced no more than $600 (matching the OnePlus 6T), while the V50 should be no more than $750. Priced correctly according to them will probably be $999. The problem isn’t that the phones are “too expensive” it’s that the people in forum chats can’t afford what they want. Obviously there are enough people buying high end phones or they wouldn’t keep making them. I wasn’t complaining about the price I just said what they will probably price it at. Well if you can’t afford it then get something cheaper. Sometimes these comments are nothing but people who can’t afford a product that wasn’t intended for them complaining about the cost. If you think it’s too expensive, it’s not for you. People seem to understand that in other categories like cars, houses, and clothes why not in phones? That’s true sometimes, but others- you can’t get everything you want in a flagship. In computers you get whatever you want by paying the price. In flagship phones you pay up the kazoo but still have to make do without something you want. If you want to save a bit of money you can buy a year old flagship for less than half what it was when introduced when the new model is for sale. I had a choice of a new Moto g6 or a year old V30 both about the same price. The quality of the V30 is considerably better if nust for the OLED screen and the fact that VOIP works properly (it doesnt work well if ag all on Moto phones). You need to be careful though and find the Tmobile model number and search for that. If you get the international version or an AT&T version you will be missing half the Tmobile bands. LG lists the model numbers for all cell companies on their web page. I’m a big fan of buying last year’s fashion accessories: cars, clothes, skis, and phones. Gal Gadot just broke up. I’ll stick with my OnePlus 6T, the OnePlus has faster speeds with 8gb ram. what oneplus 6t does not have faster speed. Where did you get that information lol? I’ve owned a Samsung Note 9, iPhone X, and so far this phone is faster at opening apps and such for half the price. Save your money. Your current phone will do just fine until the 5G phones start rolling out. Why waste your money on just another 4G phone.